This lady beetle is as convex as C. californica. However, it has 3 spots on each elytron with 1 additional spot at the base of each elytron which, together, form 1 large spot. The pronotum has 1 large spot on either side. The head has 1 spot on either side of the head. It has been repeatedly introduced in the US from Europe to control aphids. 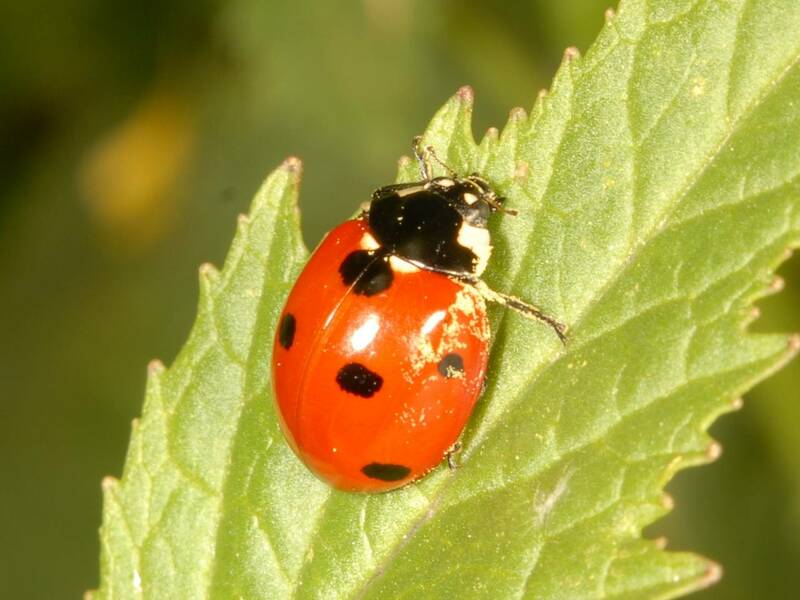 This widespread palearctic species was intentionally introduced into N. America several times from 1956 to 1971 for biological control of aphids. A11 of those attempts apparently failed in getting C. septempunctata established, but in 1973 an established population was found in Bergen Co., New Jersey. This population is thought to have been the result of an accidental introduction rather than a purposeful one (Angalet and Jacques, 1975). Since 1973, this species has spread naturally and been colonized and established in Delaware, Georgia, and Oklahoma. (Gordon 1985) It has since spread throughout North America. Throughout NA and most of the Old World. Throughout North America and most of the Old World.